School finished yesterday. I made it, and, I also made it to the finals. Still, my Dutch teacher gave me an assignment for the holidays for which I also have to read a book. Reading is very hard for me, but I really love good stories. That’s why I prefer audio books. Papa bought me the complete collection of Harry Potter’s audio books for the holidays. In English of course. For my holiday assignment I will read Kruistocht in spijkerbroek. We left early Friday morning with two minibuses to Austria with a large Belgian climbing team. Saturday I climbed my first qualification route in the morning. Joke Pierssens had to climb 9th and I directly after her. Maëlys had to climb 28th. There were 39 girls in our category. I did a very good job in the first qualification, placing 3rd. In the second, I couldn’t get passed the crux, but this was still good enough for a 5th place overall. 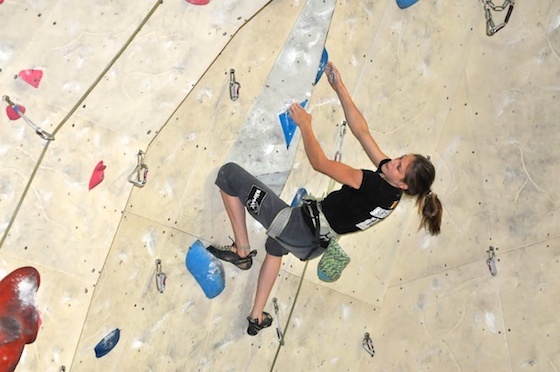 Only Hannah Schubert (AUT) and Franziska Sterrer (AUT) climbed higher. 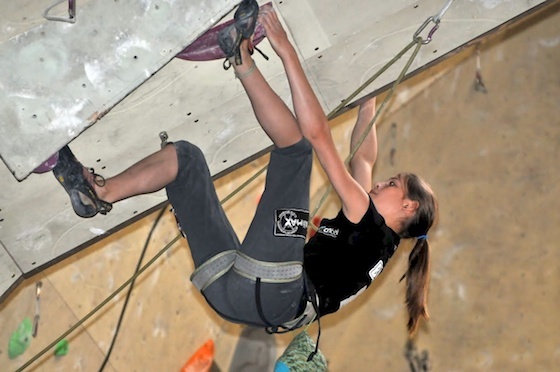 Hannah made a big performance by reaching the top and as first climber in the route. It was very hot in Austria, over 30 °C. One side of the climbing gym was very hot in the morning. The centre part was hot all day. And the other side became hot in the afternoon. Joke and I had finished our routes when Tijl came to tell us that there was a water fight going on outside. We had a look and the French team asked: “Avez-vous déjà grimpé?” Joke hesitated: “Eh,… non”, but I said: “Joke, they say déjà grimpé,…” so I quickly corrected: “Oui, oui nous avons déjà grimpé.” We hurried back inside to change our shirts and take some bottles of water with us. The Flemish boys also came along. As soon as we came out, the French team shouted: “Il fait chaud, n’est-ce pas?” And at the same time we got a splash of water all over us. It was great fun throwing water among the French, Austrian and German climbers. The next day I had to get up very early again and this is not my strong point. I was very tired. I guess I still have to get used to this new way of life. I would have loved to reach the module where you had to make two foot hooks. That looked so gorgeous and great to do, but I didn’t get that far. I fell early because I had trouble finding the good foot holds. This was not good, but I’m still sixth on the European ranking.